Teaching a child to tell time on clock (with hands) can be one of the hardest skills for a child to master! I know my son gets really confused when I try to explain it to him because he can see the big numbers (1, 2, 3, etc) but they actually mean 5, 10, 15, etc. Telling Elapsed Time is EVEN HARDER and you definitely need some good resources to help teach that to any child! Where do you get one? Learning Resources!!! They offer this great Magnetic Elapsed Time Set and it is so great for teaching any child how to tell how much time has elapsed. This segmented timeline helps students understand that elapsed time can begin in the PM and end in the AM. In this great set are 2 magnetic clocks with hands, 24-hour timeline (4 segments), start and end time arrows, and removable guide numbers. I love that there are two clocks for easy visualization of time lapse and I love that they are magnetic so I can stick them wherever to practice all day long! I also really like that there is a 24-hour timeline so they can learn to tell time lapse and time throughout the whole day. The start and end time markers are also so great also for children to visualize the time lapse. 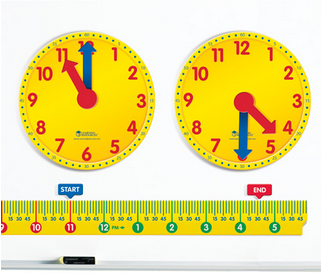 The clocks measure 10” and are appropriate for Grades 2+. If you have been struggling teaching your child how to tell time or time lapse, then make sure you get this really great learning resource: the Magnetic Elapsed Time Set. It help eliminate the frustration of both your child and of you! Buy It: You can purchase the Magnetic Elapsed Time Set for $24.99 on the Learning Resources website. Win It: Learning Resources is generously offering (1) Magnetic Elapsed Time Set to a lucky winner!